After two intense years in the Masters program the faculty of Environmental Studies at York University, I have graduated! I’m excited about the shift in direction of my work. I’m now exploring Sonic Walks, a hybrid art-form that involves listening, walking and participating. I will be leading a SonicWalk for 71*11d performance art festival. I’m happy to share my enthusiasm for sound with my audience/participants. 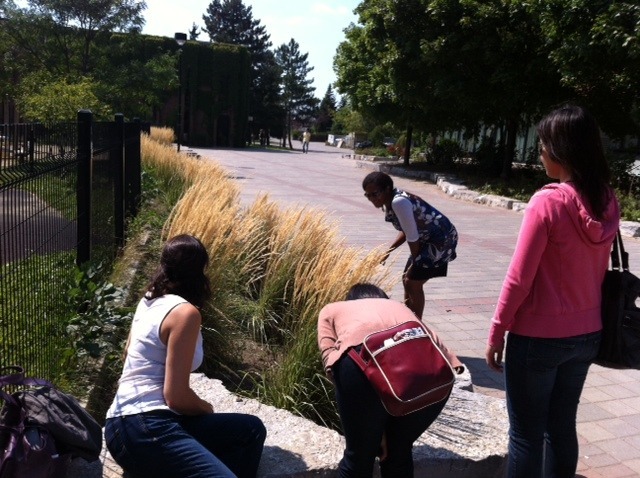 This Sonic Walk will be similar to the one I facilitated for York University’s Summer Institute this August. I will be presenting a set of instructions to visitors to the festival who will embark on a journey of discovering and engaging with worlds enfolded in worlds through tuning into sound. My sonic walk exploration started when I decided to transform Miss Canadiana’s Heritage and Culture Walking tour into an app. With my supervisor’s (Honor Ford-Smith) encouragement, I explored more experiential ways of presenting the work that went beyond the documentary frame. I endeavoured to express what Toni Morrison calls “the truth” rather than “the facts”. I ended up creating and recording HUSH HARBOUR, a Sonic Walk that situates participants in the midst of Toronto’s Black past. Creating the work has been a powerful experience that continues as I take people on the walk and witness their responses. This work engages participants on a visceral level and opens a space for contemplation and questioning. It is my intent to create more Sonic Walks and to initiate others into the wonderful practice of experiencing the world through sound. If you are interested in experiencing HUSH HARBOUR, you can download the walk, install it on your mp3 player or smartphone and a good pair of headphones go to the North West corner of Wellington and Portland to follow the instructions you’ll hear…or you can contact me and I will walk with you and discuss the project with you. I have taken many people on the journey and I have presented the work to students of Performance, Women’s studies and Caribbean studies. Please also come and join me in an exploration of sound at 7a*11d Festival. when: October 28, 2012 at 2:30 pm.